Email your D.C. Congressional Staffers! MORE U.S. Senators needed to Co-Sponsor S.1174 ASAP!!! An easy & effective outreach method to convince your 2 U.S. Senators to co-sponsor the 65th Infantry Borinqueneers CGM legislation (bill S.1174) is to email their primary staffers in D.C.
You do not have to be a constituent of a Senator's state to write to the staffers. However, it's usually more effective if you are. So, also tell your friends & family who live in the states of the needed Senators. Further below is a list of the Chief of Staff, Legislative Director and Communications Director for all of the 100 U.S. Senators, 435 U.S. Representatives and 6 Territorial Delegates. We also have email contact information on the military legislative assistant staffers for various members of Congress. If you'd like that contact information as well, please contact us. Please use the links below to find your your two U.S. Senators. You can contact the staffers of your 1 U.S. House of Representatives member if your time permits. Click here to see if your 2 U.S. Senators have co-sponsored already: Honor Roll of Senator Co-Sponsors! Click here to see if your 1 House member has co-sponsored already: Honor Roll of House Co-Sponsors! If your 2 U.S. 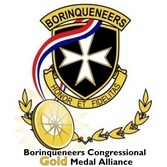 Senators & 1 U.S. House member have co-sponsored the 65th Infantry Borinqueneers CGM legislation already, please reach out to the staffers of the other members of congress within your state's delegation who have not done so. If any email contact is incorrect and/or you receive an undeliverable email message, please contact us and we will try to obtain the correct congressional staffer's email address for you. Often times, there is a lot of staffer turnover in Congress so the below list is NOT 100% accurate. You can also download this spreadsheet for your reference and circulation among your channels. MORE WAYS to contact YOUR Senators!